The invasion was intended to punish Tūhoe for supporting Te Kooti Rikirangi, whose ‘rebel’ force it had sheltered after their defeat at Ngātapa, inland from Poverty Bay, in January. The expedition was also intended to send a signal that there was no sanctuary – however remote from Pākehā settlement – for disaffected Māori. 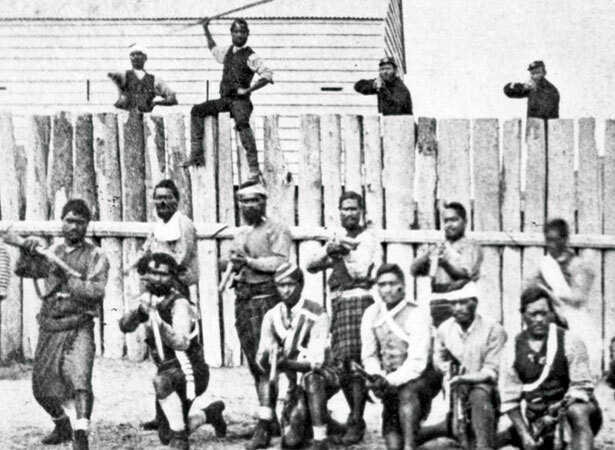 Three columns of Armed Constabulary and kūpapa Māori were to converge on Ruatāhuna, deep in the interior. The 1300 men outnumbered the entire population of the Urewera. Two columns started in Bay of Plenty, while a third on the east coast got no further than Waikaremoana. The Rangitāīki column first saw action on 6 May near today’s village of Te Whāiti, killing five Tūhoe. After it met up with the Whakatāne column at Ruatāhuna on 9 May, several days were spent destroying settlements, crops and food supplies. This invasion of the Urewera was followed by another three-pronged attack in 1870 and several subsequent kūpapa incursions in search of Te Kooti, who hid in Tūhoe territory with his dwindling force even after he was renounced by the iwi. We have 18 biographies, 13 articles, related to Colonial troops invade the Urewera.